Modern suffering man is the heir to this psychological event which took place culturally some eight hundred years ago. Usually he seeks an unconscious solution outside of himself, complaining about this work, his marriage, or his place in the world. Our story begins with the Grail castle, which is in serious trouble. The Fisher King, the king of the castle, has been wounded. His wounds are so severe that he cannot live, yet he is incapable of dying. he groans; he cries out; he suffers constantly. The whole land is in desolation, for a land mirrors the condition of its king, inwardly in a mythological dimension, as well as outwardly in the physical work. The cattle do not reproduce; the crops won’t grow; maidens weep; there is mourning everywhere – all because the Fisher King is wounded. The whole Grail castle is in serious trouble because the Fisher King is wounded. The myth tells us that years before, early in his adolescence, when he was out wandering around in the woods doing his knight errantry, the Fisher King came to a camp. All the people of the camp were gone, but there was a salmon roasting on a spit. He was hungry, there was a salmon roasting over the fire, and he took a bit of it to eat. He found that the salmon was very hot. After burning his fingers on it he dropped the salmon and put his fingers into his mouth to assuage the burn. In so doing he got a bit of the salmon into his mouth. This is the Fisher King wound and gives its name to the ruler of much of our modern psychology. Modern suffering man is the heir to this psychological event which took place culturally some eight hundred years ago. Much is to learned from the symbol of the wounded Fisher King. The salmon or, more generally, the fish, is one of the many symbols of Christ. As in the story of the Fisher King coming upon the roasting salmon, a boy in his early adolescence touches something of the Christ nature within himself but touches it too soon. He is unexpectedly wounded by it and drops it immediately as being too hot. But a bit of it gets into his mouth and he can never forget the experience. His first contact with what will be redemption for him later in his life is a wounding. This is what turns him into a wounded Fisher King. The first touch of consciousness in a youth appears as wound or as suffering. Parsifal finds his Garden of Eden experience by way of the bit of salmon. That suffering stays with him until his redemption or enlightenment many years later. Most western men are Fisher Kings. Every boy has naively blundered into something that is too big for him. He proceeds halfway through his masculine development and then drops it as being too hot. Often a certain bitterness arises, because, like the Fisher King, he can neither live with the new consciousness he has touched nor can he entirely drop it. Every adolescent receive his Fisher King wound. He would never proceed into consciousness if it were not so. The church speaks of this wounding as the felix culpa the happy fall which ushers one into the process of redemption. This is the fall from the Garden of Eden, the graduation from naive consciousness into self consciousness. I doubt if there is a woman in the world who has not had to mutely stand by as she watched a man agonize over his Fisher King aspect. She may be the one who notices, even before the man himself is aware of it, that there is suffering and a haunting sense of injury and incompleteness in him. A man suffering in this way is often driven to do idiotic things to cure the wound and ease the desperation he feels. Usually he seeks an unconscious solution outside of himself, complaining about this work, his marriage, or his place in the world. The Fisher King is carried about in his litter, groaning, crying in his suffering. There is no respite for him – except when he is fishing. This is to say that the wound, which represents consciousness, is bearable only when the wounded is doing his inner work, proceeding with the task of consciousness which was inadvertently started with the wound in his youth. This close association with fishing will soon play a large part in our story. 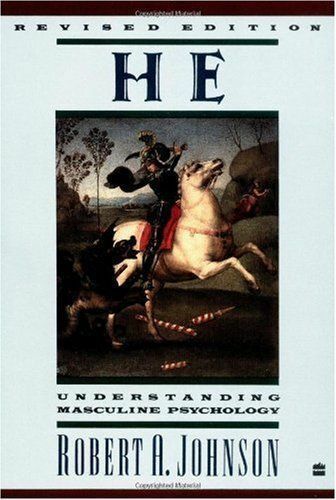 — He: Understanding Masculine Psychology, Robert A. Johnson, 1989. This entry was posted on Thursday, August 30th, 2012 at 5:45 am and is filed under Inner work. You can follow any responses to this entry through the RSS 2.0 feed. You can leave a response, or trackback from your own site.